Yesterday was move in day for me to kick off my junior year of college at Furman University. I still can't fathom the fact that I am an upperclassman AND am halfway finished with college. If anyone has any insight on how that happened I would love to know! One of my favorite things about Furman is the ability to live on campus all four years of college. Over the past two years I have lived in dorms with a roommate and this year I upgraded an apartment that I am sharing with 3 roommates! You could say I have a bit of experience when it comes to living with other people so I thought it could be helpful for any of you new college students to share the tips I have to make your living situation comfortable and cooperative! Although this year we all have our own rooms within the apartment we still have a great deal of shared space that needs to be respected so you can bet I'll be checking back to some of these tips myself to make sure that our living situation is a great one! 1. Communicate Expectations at the Beginning | By starting out by clearly stating the expectations you each have, those expectations are more likely to be a reality. This beginning communication is crucial as you begin living together. If you're really particular about certain things, let your roommate know of that! communication is key for having a great experience! 2. Lock the Door | This should go without saying. I do not understand my friends who don't lock their dorm room doors! How terrible would you feel if you left the door unlocked and your laptop and great grandmothers pearl necklace were taken. Now picture if that same thing happened to your roommate and it was your fault. Locking your door takes about 15 seconds and is an easy way to prevent conflict. A fun bonding event could be you and your roommate shopping for cute key rings to keep your key on! 3. Give Your Roommate Alone Time In The Room | This is something that I think everyone should be conscious of and I personally had to focus on during second semester of this past year. 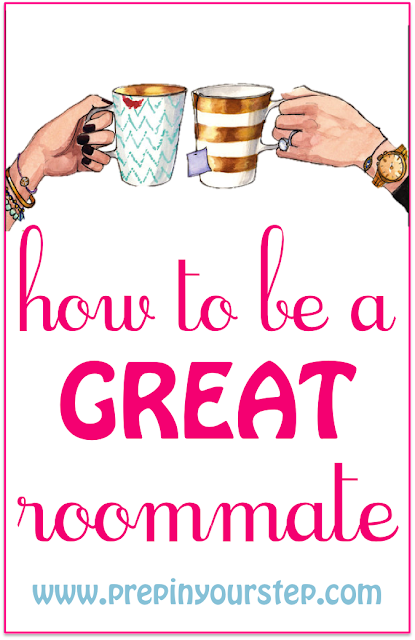 It is unlikely that your roommate and you will have identical schedules so by just going to class you are already likely providing your roommate some time alone in the room. In college you are surrounded by people nearly all the time so a little alone time in your own space is nice! Go to the library or the gym to allow them some alone time. 4. 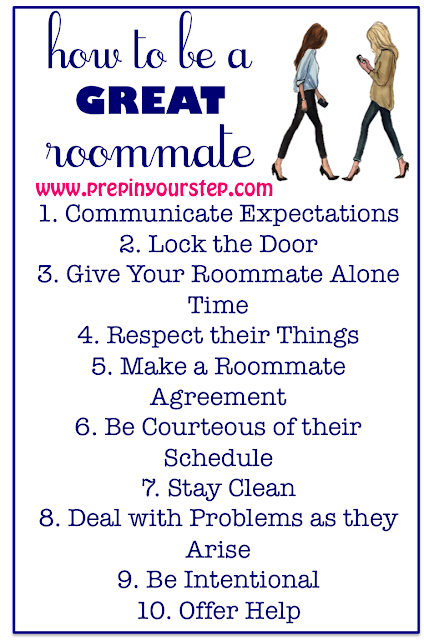 Respect Your Roommates Things | This is something you and your roommate can talk about when you communicate your expectations, as suggested in tip #1. I would recommend that you always ask before borrowing even if y'all decide that your stuff is my stuff and my stuff is your stuff. 5. Make A Roommate Agreement | Furman does this at the beginning of the year for all freshmen and that may be why so many roommate relationships are a success. This is a survey of sorts that we did with our RA that covered questions ranging from: How do you feel about room visitors? / What do you think of your roommate borrowing your things? These questions provided great insight into your roommates lifestyle. 6. Be Courteous of their Schedule | Your roommate goes to bed early and you need to stay up late and study? Turn off the overhead light and allow her to sleep and flip on your desk light so that you can still see to study! Today is your roommates sleep in day and you have class at 8:30? Try to turn your alarm off after the first couple rings and be quiet as you head out the door! 7. Be Clean and Cleanup After Yourself | Nothing is more annoying than coming back from a rough day of class to dishes in the sink and clothes strewn about because someone had a presentation today. You wouldn't want to do this to your roommate and hopefully your roommate won't do that to you! Your room doesn't have to be as immaculate as a museum but try to keep things organized and your stuff on your side of the room. Take turns taking out the trash and vacuuming the room! 8. Deal With Problems As They Arise | Don't let emotions and conflict build up between you and your roommate. If you deal with problems as they arise corrections can be made instead of you just assuming your roommate will pick up on your passive aggressive hints. Don't blow up on your roommate, everything after that will just be uncomfortable. 9. Be Intentional With Your Relationship | You're going to the dining hall to grab some coffee, ask if your roommate wants some or wants to come. Going to the grocery store, see if your roommate needs anything! Just by offering you are allowing your roommate to see that you want to get along and you are finding ways to grow closer. 10. Offer Help | See that your roommate is struggling with something? Offer assistance! It won't go unnoticed and it's likely that help will be offered to you in return. Didn't feel like reading that? Hear me discuss the same tips in this video I made for y'all! 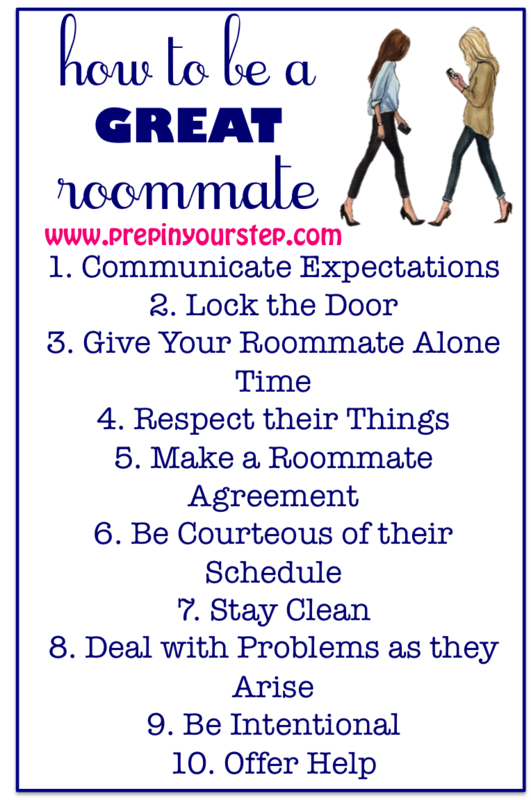 I hope these tips help you to forge a positive relationship with you roommate! If you have any other ones I may have forgotten leave them below! PS this is nearly identical to the post I did last year (here) which is to date my most viewed post ever! I thought that was a fun fact to throw in for y'all! Happy Monday! Good luck with your junior year! College certainly flies by and before you know it, you'll have graduated and be out in the real world like me! This would have been so handy to have read before I came in my freshman year. As a senior I can totally agree with all the points you made! Thankfully I never had a roommate (because I didn't live the dorms!) but even now that I'm a senior and married (what?! Time flies lol) some of these things are still applicable to living with my husband. Great advice! Love these tips! Can't wait to see pictures of your apartment! Great advice! I look forward to getting a roommate next year as a Freshman! Today's apple is spinning at the acceleration of ablaze and it seems infiltrated by deadlines on top of breitling replica deadlines. In this anarchic ambiance the watch is absolutely in demand! For some their time section is even calmness at moments. There are array to accept from in abounding styles and personalities. Beyond that there are a amount of brands with ample capricious amount ranges. Abounding do accept a few watches for altered occasions, generally analytic priced. Though there are aswell those enthusiasts who avidly aggregate abounding watches and generally they are absolutely cher as well.It all began at a Paris jewellery branch run by hublot replica Adept Adolphe Picard. In 1847 if Picard anesthetized away, Louis-Francios Cartier took over afterwards his master. It became a ancestors business and connected through to the next century. Louis-Francios's son Alfred Cartier was complex in 1904 if he abutting minds with allegorical watchmaker Edmond Jaeger to accomplish the aboriginal Cartier watch to be beat by pilot Santos-Dumont if flying. Today the name Cartier has maintained authority for about 160 years and alone associated with quality, elegance, and performance! If it comes to the Cartier watch, alone the best is used. The accomplished cast jewellery and alone the a lot of absolute automated functionality are activated with the accomplished standards as annihilation beneath will do.The Cartier watch is advised to action added than just a watch. Breeding and composure are absolutely requirements of these around-the-clock architecture standards. The Cartier watch generally becomes an antique of its owner, anesthetized own through the ancestors to cartier replica come. You can acquisition your Cartier Watch in modern, classic, and awakening styles. There's even an accustomed Cartier watch with roman numerals, alligator strap, and as with all Cartier watches their cast azure on the bulge as able-bodied as azure clear faces to abide scratching.Among the alternative you will aswell see the college end Cartier watch alternative including abounding adored metal bands of gold and platinum. Taking affliction in accurate alternative of these will amount you a bundle, but should go down in your ancestors history well. The louis vuitton replica ultimate would accept to be the Cartier D'art bound copy models. In this band you will acquisition the Cartier watch of all Cartier alignment from fractional to complete design accoutrement and the Cartier signature: the panther.